An optometrist in Derby is being praised by a customer after spotting the signs of her painful sight-threatening condition. 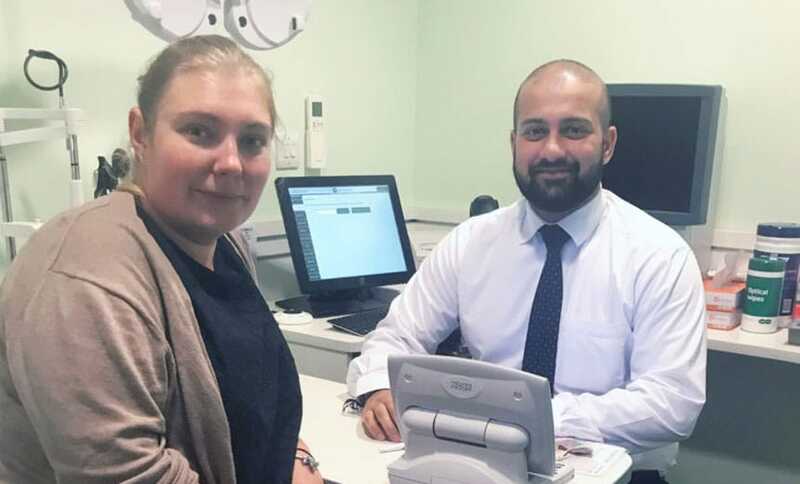 Optometrist Satbir Jhangra conducted the eye test which Anna Misalska described as both thorough and professional. He swiftly recognised that there was a significant swelling around Anna’s optic nerve. On arriving at the Royal Derby Hospital, Anna was initially seen by an ophthalmologist, who referred her to the neurological department for a CT scan. The results revealed intercranial hypertension – an elevation of pressure caused by excessive fluid that surrounds the brain. She was kept in hospital for several days, during which time she received a lumbar puncture to relieve the pressure. The procedure involves inserting a needle into the lower part of the spine to measure pressure and draw off cerebrospinal fluid from inside the spine to lower the pressure around the brain. Anna says: ‘Without the procedure, the pressure would have continued to cause me pain and distress, and could possibly have left me with permanent damage. I’m so thankful to the team at Derby Specsavers for spotting the problem and acting quickly.